At the beginning of August, we left Colombia and returned to Ecuador, where we started our big South American journey. Our big backpacks were safely stored in the hostel where we had previously volunteered in Quito, so when we returned to Ecuador, our main mission was to pick up all the baggage and continue our journey south to Peru. We had about twenty days left on our 3-month Ecuadorian visa – which we initially wanted to use for slowly travelling to the South. Peter was quietly dreaming about staying in Quito longer and volunteering again in the nice hostel. I seriously didn´t think this could have happened as there were always more applicants than volunteering positions and they were rarely looking for two people at the same time. To my surprise, his dream came true we stayed and worked in Quito for almost two weeks. We tried to hitchhike right after the Colombian-Ecuadorian border crossing in Tulcan. We were already familiar with the way to Quito because we had already done it in reverse six weeks before. After a few minutes of waiting, a Skoda Felicia car stopped with a nice family inside. They took us outside the town to the better hitchhiking spot. We were genuinely happy to be seated in a vehicle which was originally from Czechoslovakia during our first hitchhiking experience in Ecuador. As the day continued, no one stopped and it started to rain a little, so we considered other options. Just then, a great guy picked us up, who took us all the way to Otavalo, which is halfway to Quito. Our driver, whose name I forgot unfortunately was a middle-aged man, who studied at Sorbonne university in Paris, France . Most of our two hour´conversation was him reminiscing of campus times and international girlfriends. When Peter and I spoke to each other in Slovak, he immediately noticed that our language sounded like Polish. He told us that he had never visited Poland but had a Polish girlfriend before. He also recalled snowy and cold European winters and during all his crazy student periods. We had a lunch in Otavalo and realized that the prices were shown again in American dollars and not in four digits of Colombian pesos. We talked about the „dollarization“ in 2000 when the old currency sucres was replaced by American dollar and compared the situation with Slovakia and the year 2009, when we adopted EURO. It was simply a great hitchhiking experience! 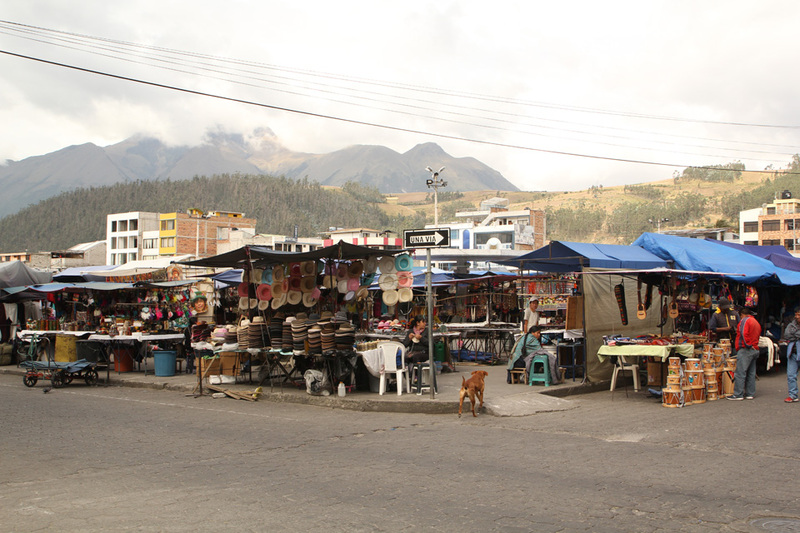 Otavalo is a middle sized town, well-known for the Saturday Market, which is allegedly the largest and undoubtedly the most touristy market in Ecuador. We were there on Friday and only a few stalls were open however the traditional products and the atmosphere were very present. 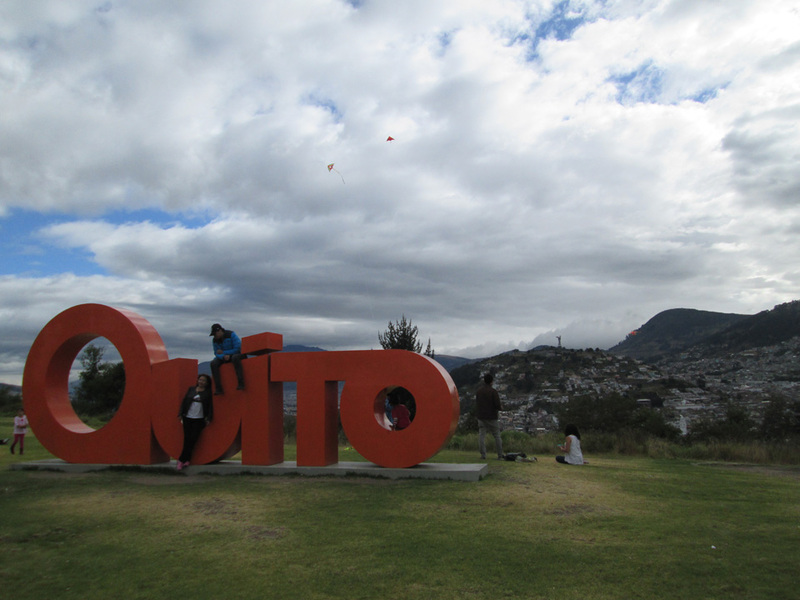 Our attempt for hitchhiking from Otavalo was not successful, so we took a bus to Quito. We really enjoyed our unplanned two-week long volunteering. It was nice to be back in a quiet hostel after our Colombian adventure. We once again slept in the staff dorm and worked at the reception. Our previous experience working reception at the hostel made it easy to jump back in without needing to relearn everything. Ivan from Colombia, with whom we worked before was still in the hostel but all the other volunteers had already left. We met a new guy from Australia, named David. The weather in Quito changed too, it was warmer and almost without rain. A big change compared to the rainy May. We fully enjoyed visiting the old places again. 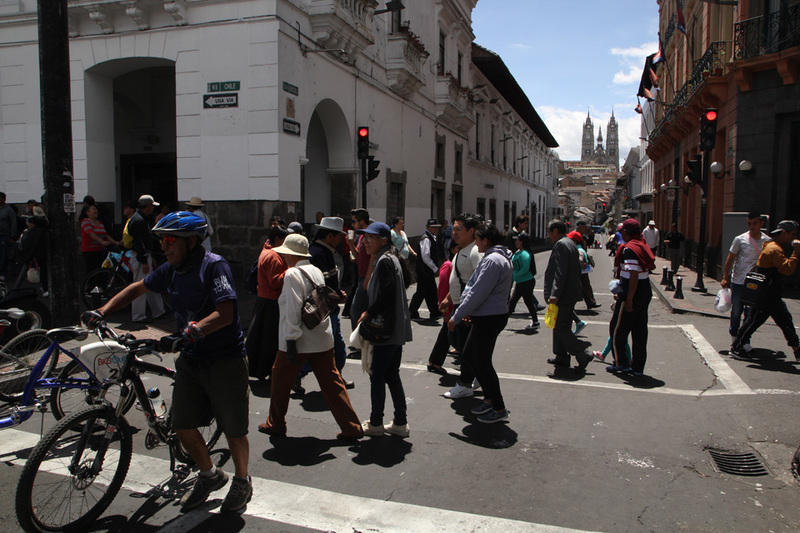 Quito is a really pleasant metropolis and we truly didn´t want to leave. During the first weekend of August is Quito fest – the biggest music festival in Ecuador took place in Itchimbia park. The entrance fee for one day was quite expensive, 30 USD, and we worked through the whole weekend so we only listened the rock bands from behind the fence. Sometimes the music was so loud, that we heard it in our hostel garden :). The headliner, a Brazilian metal band named Sepultura was extra heavy! I liked an Ecuadorian group called Swing Original Monks the most. We were able to give really accurate information about the Quilotoa Loop Trek since we had recently explored it for ourselves before our time in Colombia. There are two main ways to travel in South America. One can go either from the South to the North or vice versa. There are no accessible roads leading via the Amazon so the travelers coming from the South, from Peru, were usually heading to Colombia. During our second stay, there was an American girl named Kate, who just returned to Quito (and to our hostel) after completing a two-month biology research study with Loja University in southern Ecuador. We were very pleased that she remembered us :-). We also met a few families with small kids who all traveled the world long-term while children were taking online classes. During the second week of August, The Festival of Lights (Fiesta de la luz) took place in the historical streets of Quito. 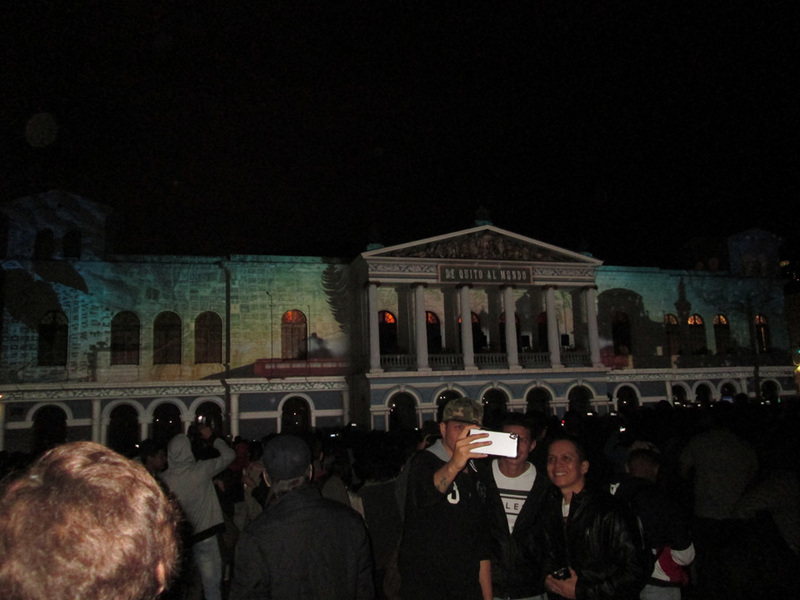 The whole center was awake, streets were pedestrians-only, there were tons of police patrolling and the light show was amazing as it played on the old buildings. Canelazo, a traditional hot alcoholic drink made from sugar cane cost only 50 cents, so we warmed us up every night :-). One Saturday, we somehow managed to have a day off together. It was something unimaginable during our first volunteering in May andwas only possible this time because the son of the owner, Borys, was sometimes working too. 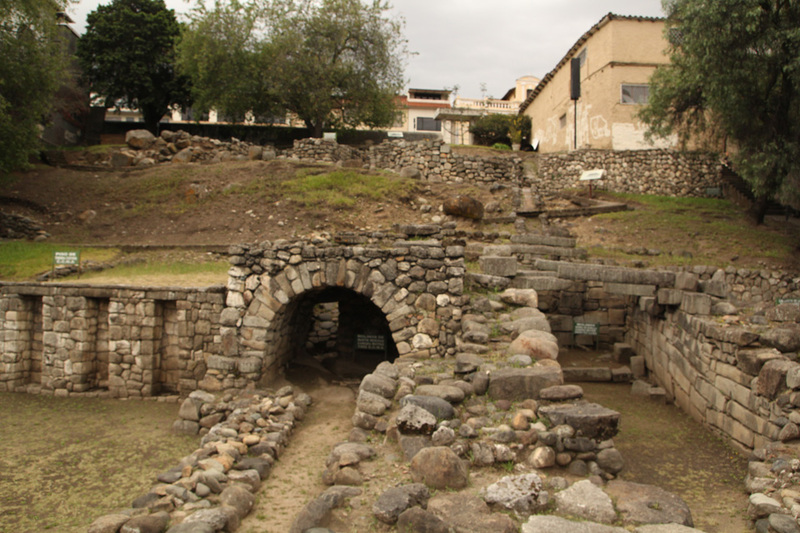 We fully enjoyed our free day and went for a trip to Papallacta. 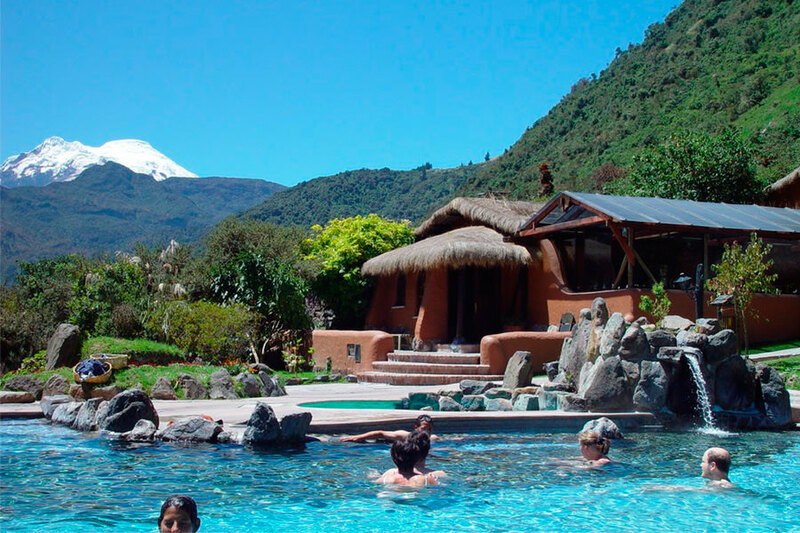 There are thermal baths located about 60 km eastward from Quito, situated high in the Andes at around 3000 meters. This well-known spa consists of more than ten pools of various sizes and water temperatures. During our five-hour stay, we tried all of them, moving from the warmest ones to the coldest ones (the freezing pool was filled with the super cold mountain stream water and we literally managed to stay there for only a few seconds :). The closing time was at eleven, so we had the chance to experience bathing under the star sky with the outside temperature of 7°C which was pretty impressive. Cuenca, the third largest Ecuadorian city, became our last destination in the country. 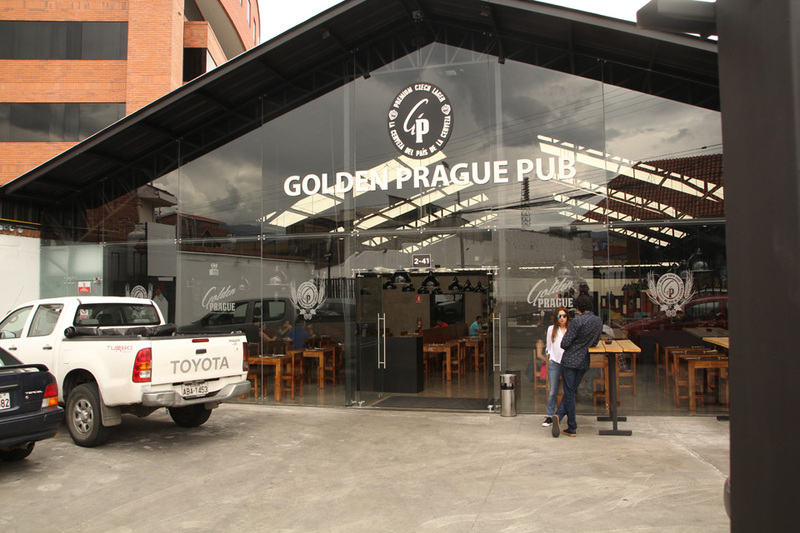 From there, we took a night bus to Peru. Cuenca lies in a comfortable altitude (2500m.). It was mostly sunny with sporadic showers during our three-day stay. 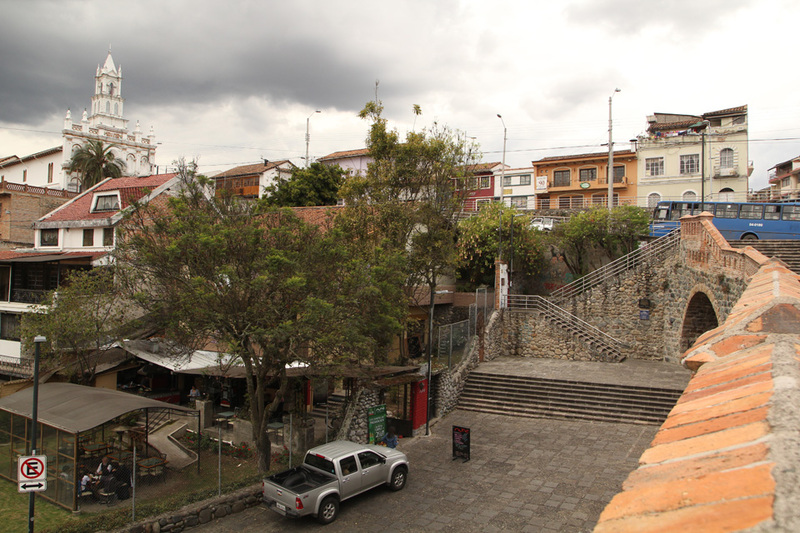 The historic center is protected by Unesco and compete with Quito for the title of the most beautiful colonial city. Peter was a bit sick so we didn´t really explore too much. 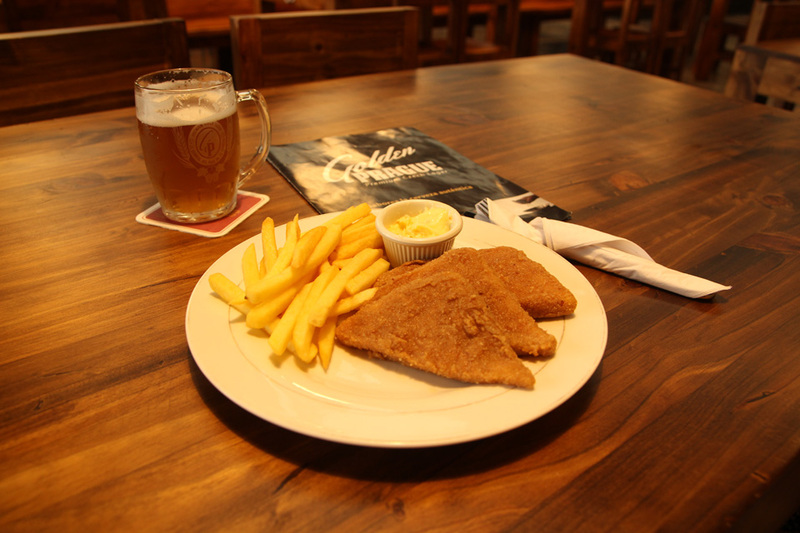 We bumped into a Czech restaurant called Golden Prague Pub where we ordered exquisite fried cheese and super tasty Czech beer. It was simply an unreal moment to eat our favorite home food far away from home. Peter also spoke a bit with the managers, who started running the place only this summer. In Cuenca, we experienced our second Ecuadorian Couch Surfing and we again were not hosted by a local but by a person named Ene from Honduras who is currently working as a doctor in a nearby villages. There were many other couchsurfers from South America and their cats staying at his flat so it was really noisy and sometimes a crazy stay. 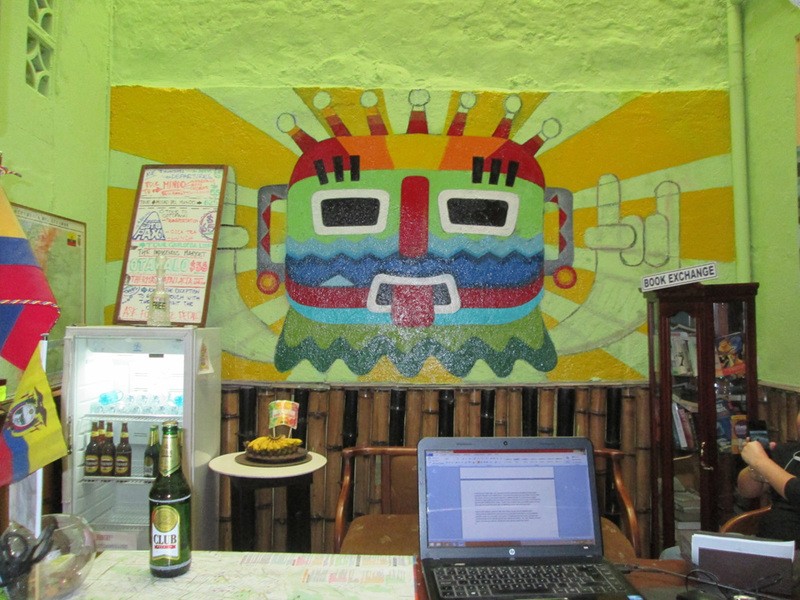 We truly enjoyed our second shorter stay in Ecuador, it was nice to chill in Quito after our crazy Colombian trip. The energy we gained there is now being spent for exploring Peru.